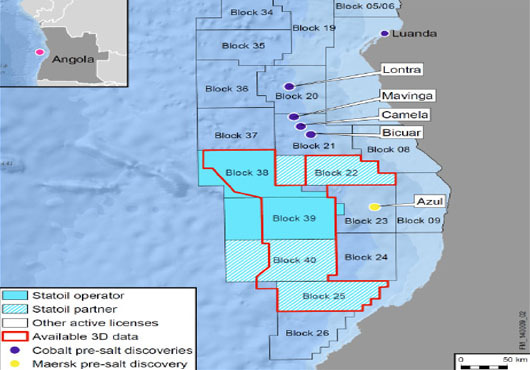 Statoil said it is divesting equity in blocks 38 and 39 in the Kwanza basin offshore Angola. “The transactions are part of Statoil’s continued optimisation and portfolio adjustments process. We do this to maximise value of core assets. The transactions will allow Statoil to unlock capital ahead of an extensive drilling campaign in the Kwanza basin,” says Gareth Burns, senior vice president in Global Strategy and Business Development (GSB) in Statoil. Statoil has divested 10% to Ecopetrol in blocks 38 and 39. In block 39 the 10% divestment is accomplished through two separate, but simultaneous transactions. Statoil acquired 7.5% from Total under one agreement. Statoil then divested a total of 10% in block 39 through a separate agreement, reducing its net equity by 2.5%. The deals are subject to approval by Sonangol E&P, the Angolan minister of petroleum and the licence partners. Ventures and Genel Energy plc) of a 15% interest in block 39 from Statoil and a 15% interest in block 38 from China Sonangol International Holdings. These transactions have now received the approval of Sonangol P.P., the Angolan Ministry of Petroleum and the licence partners, and pending formalities are expected to be completed shortly. Block 38: Statoil (Operator – 45%), WRG (15%), Ecopetrol (10%), Sonangol P&P (30%). In addition to the Statoil-operated blocks 38 and 39, Statoil is partner in blocks 22, 25 and 40 in the Kwanza basin. The exploration blocks were awarded by Sonangol in December 2011. German Based RWE Begins Gas Deliveries to Ukraine: An alternative solution to Russia gas?